Lowrider girl drops her first album! Born and raised in Los Angeles, California, Doll-E Girl has been around the city's trend setting lifestyles of hip hop and lowriding. From as young as she can remember, lowriders have caught her attention and she dreamed of owning her own ride as soon as she acquired her driver's license. That day came and now Doll-E is cruising in a dropped '62 Cadillac Coupe Deville and is a proud seven-year member of Night Crowd Car Club. Doll-E has always been a fan of gangster rap music, but never really gave it much thought of actually being behind a microphone spitting lyrics to other hip hop fans. Last January her first full length CD was released, To Know Me Is To Love Me. The album features appearances on selected tracks by L.A. Hitman, Tony G., Lil' Blacky, Lil' Sicko, Synful, DTTX (of Lighter Shade of Brown), Sal Capone and J.V. Recorded at L.A. Hitman Studios, the album came out with professional quality supplemented by bangin' beats. 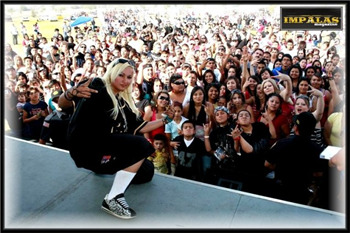 Doll-E says that in Albuquerque, New Mexico and Tucson, Arizona that the album received a lot of hype thanks to radio play. In Doll-E's own Los Angeles, the CD has not yet received radio airplay but the sound scan sales numbers show that the CD is selling excellently. Not bad considering that there has been no major promotion for the album! Doll-E Girl, also known as La Mafiosa Mama, says that she really appreciates all the people who have helped her and supported her. Doll-E's humble demeanor shows as she says she doesn't expect that her music is going to blow up to the point where you'll see her on the next episode of MTV's "Cribs", but she still gives her music - from producing, writing and performing - one hundred percent effort. Doll-E continues to cruise with her car club, go to school and overall, better herself. She has begun to work on her follow-up album but she is also in the works of touring for the summer months to help support the current release. Can I pull on your hair?